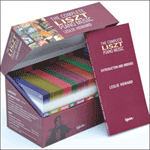 Some of Liszt’s Schumann transcriptions have withstood all vagaries of fashion and have featured in the repertoire of every generation of pianists, while others remain sadly unknown, as do some of the Schumann originals. Liszt’s choice of Schumann seems largely to ignore the well known and to investigate some of the later, most intimate works. Andersen’s ‘Christmas Song’ is really a very simple hymn, and ‘The Changing Bells’ is a straightforward setting of a little moral fable by Goethe in which a recalcitrant boy is frightened by a dream of bells into going to church as his mother has told him. Liszt does not seek to elaborate in any way in these ten songs of Robert and Clara—often giving almost the original piano accompaniment in small type with the vocal line in full-size notation distributed between the two hands. Fallersleben’s ‘Coming of Spring’, Schiller’s ‘The Cowherd’s Farewell’ (which Liszt set before Schumann did), and Mörike’s ‘The Spring it is’ tell their tales in their titles, and Goethe’s ‘None but the lonely heart’ (set by many a composer—four times by Beethoven) requires no introduction, and ‘I shall creep from door to door’ is the third of the evocatively miserable Harper’s Songs which were first well known in Schubert’s settings. 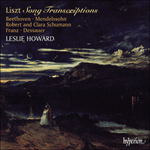 Despite the appalling rudeness eventually shown to Liszt and his music by Clara Schumann—she removed his name from the dedication on Robert Schumann’s Fantasy, opus 17, and she rejected Liszt’s dedication to her of his Paganini Études, having been initially quite besotted by him—Liszt tried to disseminate three of her songs in very delicate and literal transcriptions. All that can be observed is that neither the songs nor the transcriptions took hold, and Clara’s Rückert settings, ‘Why would you ask more questions’ —a plea not to question a lover’s sincerity—and ‘In your eyes have I seen eternal love’ and the setting of Rollet’s love and nature poem ‘Mysterious whispers here and there’ have a charm just a bit too obviously derived from the music of her husband.